Complete The Forsworn Conspiracy and go to jail. Brawl, bribe, and/or lie your way into a meeting with Madanach. Follow Madanach's instructions and escape with the rest of the prisoners, or kill Madanach and escape on your own. You will arrive in Cidhna Mine after completing the quest The Forsworn Conspiracy and choosing to go to jail, where Urzoga gra-Shugurz tells you that you will have to mine for your freedom. Your journal will inform you that you must find Madanach, also known as the King in Rags, to help clear your name. Head through the gate, walk down the wooden platform, and talk to miner Uraccen who is sitting by the fire. Uraccen will say that you won't be able to speak with Madanach unless you can get past his bodyguard Borkul the Beast. Uraccen can entertain you with a story of one of Borkul's exploits before you go speak with him. Borkul is guarding one of the three gates in this room. When you ask him to see Madanach, he tells you that the toll for entry is a shiv. As alternatives to his request, you can brawl with him, intimidate or persuade him, or pickpocket the key from him. Madanach is expecting me. (Persuade) Passed: Hmph. Fine. Go on in. But don't try anything in there. Madanach knows more than you think. Let me through, pig-face. (Intimidate) Passed: Those eyes. All right, killer, go on through. But don't try anything. Madanach knows more than you think. How about I fight you for it? (Brawl) Brawl: That's what I was hoping you'd say. Victory: It's been so long since I tasted my own blood. Sour. You'll let me through now? Yeah, yeah. Go on in. To get a shiv, talk to Grisvar the Unlucky, who will ask for a bottle of skooma. To get the skooma, you have to find Duach and pass a speech challenge, win a brawl, or pickpocket him. I need some. Badly. (Persuade) Passed: Getting the shakes, huh? All right. Take it. Old gods keep you. Hand over the skooma. (Brawl) Passed: Easy there. I didn't mean nothing. Take it. Victory: Damn addicts always stealing from me. Now give me that skooma. Here. I hope you choke on it. Bring the skooma to Grisvar, who will give you the shiv. If you want to keep the shiv, then you can still attempt the alternatives to completing Borkul's request. You can pickpocket an additional bottle of skooma from Duach and bribe Borkul with it. Alternately, you can also start a battle with the Forsworn prisoners (attack anyone but Grisvar). This locks you into killing Madanach, as he becomes hostile. This fight can be difficult; you have no armor, no enchantments, and your only non-conjured weapons are pickaxes and possibly shivs, though you can still use any magic or powers that you may possess. Once you've won, loot the key off Borkul's body and proceed to kill Madanach per the next section. Once you get past the Orc, you will see Madanach sitting at a desk. He will direct some disparaging remarks at you regarding your predicament, and ask you what you want. Here, you can take one of two paths: take your revenge, or find your answers. If you seek revenge, you can kill Madanach here (or at any time) and then escape on your own. If you want a fair fight, you can tell him you plan to kill him; otherwise, just attack him. 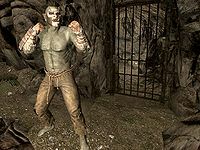 Attacking him will make all of the other prisoners hostile (except Grisvar), but as long as they are out of range, they will not rush in to join the fight. Search Madanach's body for a key and a note, then unlock the gate and exit the prison. If you seek answers instead, Madanach will direct you to Braig, another prisoner, to hear his story of injustice. After you have convinced Braig to tell his story, return to Madanach. You will see a different side of Madanach, and the horrors that drive his purpose. He tells you he wants to return to the war and will help you escape as well, but only if you prove your loyalty to him by killing Grisvar the Unlucky. If you gave your shiv to Borkul, you can get a new one from Madanach at this point. Find Grisvar and kill him. If you tell him that, "Madanach says hello", Grisvar will eventually become hostile and the other inmates will attack him. Once he's dead, return to Madanach, who will declare you an honorary member of the Forsworn and lead the prisoners to the escape tunnel. After a short speech, follow Madanach and the Forsworn through the tunnel to Markarth Ruins. You will encounter a pair of frostbite spiders, then one or two Dwarven Spheres as you make your way through the ruins. If you're on your own, you can sneak off the bridge onto the floor below, as fighting alone will be quite difficult without any of your normal equipment. Once past the automatons, continue through the ruins until you reach a short tunnel that leads to a door to Markarth. Thonar will return your equipment and give you the Silver-Blood Family Ring if you are on your own and have killed Madanach when you exit the gates. If you sided with Madanach, a Forsworn woman named Kaie will be there to return your confiscated goods and give you the Armor, Boots, Gauntlets, and Helmet of the Old Gods. The Forsworn will all equip their own armor and run out. When you follow them through the door, you will emerge into a skirmish between the Forsworn and Thonar Silver-Blood, accompanied by a Markarth City guard. After a short conversation, Madanach and the Forsworn will attack and kill Thonar, then fight their way through the rest of the city guard to the gates. Note that some of the townsfolk may be hostile to the Forsworn and can be killed during the breakout. To avoid collateral damage, wait in the tunnel until midnight before exiting out to the city, then no one except for the guards will be present. Outside the city walls, Madanach and any remaining Forsworn will then run to Druadach Redoubt where they will take up permanent residence. Madanach's Forsworn at Druadach Redoubt will remain friendly to you if you sided with him. No matter which approach you used, you will be pardoned. Run through the ruins with Madanach and acquire the Armor of the Old Gods. Keep him engaged in dialogue to stall him as the other Forsworn escape. Kill Madanach. The Forsworn will attack you once you exit. Talk to Thonar after the Forsworn are taken care of and receive the Silver-Blood Family Ring. Townsfolk will speak of how you escaped with the Forsworn and act as if Madanach escaped, however. If you finish the quest this way, Borkul the Beast will not be hostile with the rest of the Forsworn, and attacking him will incur a bounty. After talking to Thonar, he will be kneeling as if bleeding out. As the Forsworn are leaving, attack one of them, leading them to become hostile. Kill the Forsworn and simply exit. Thonar will act as if you had escaped by yourself and present you with the Silver-Blood Family Ring. If you side with Madanach, he gives you all your non-quest items at the exit of the ruin. You will receive all your quest items after Madanach has finished his dialogue with Thonar and started fighting. Your stolen items will be returned. Once either Madanach or Thonar returns your items to you, then individuals will act as if you helped that individual, regardless of whether or not you killed him after receiving your items. If you don't kill Madanach, you can follow him and his men after escaping Markarth. They will lead you to Druadach Redoubt, a Forsworn encampment and cave that is now friendly. Escaping from Cidhna Mine during this quest does not add to "Jail Escapes" statistic, nor will it grant you the Wanted achievement. The inhabitants of Cidhna Mine are all scripted to die if you decide to kill Madanach in his cell and escape from the mine alone. This quest counts towards the Sideways achievement regardless of whether you choose to help or kill Madanach. Vigilant Tyranus, required for the quest The House of Horrors, will never sleep and will thus attempt to attack the Forsworn. As he is essential but weak, he can get stuck in a fight and thus cause the battle to last much longer than necessary, so it is advised to begin his quest in order to remove him from the streets. Even if you side with Madanach, Forsworn you encounter in locations other than Druadach Redoubt will be hostile. The Markarth Ruins remain accessible after this quest; however you cannot sneak back into the mine this way as the way back into Madanach's cell is closed off. It is possible to smuggle outside weapons into the prison to use during the current quest. To do this, you must first hotkey the equipment before entering the Shrine of Talos. The items will not show up in the Character Menu, but instead will show in the HOTKEY Menu allowing you to select which hand to equip. Beware, that appears to be only quest items, but then the item(s) never appear in your inventory again. 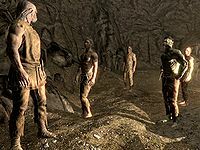 If you have Dragonborn installed, another method of smuggling possessions into the mine would be to give some of them to the Secret Servant acquired from the Black Book, Untold Legends, before being incarcerated. Once within the mine, simply summon the servant and take your possessions from him. Sometimes, the quest will not start or progress. The quest may also notify you that a stage is complete without updating your journal. Specific instances include the following: ? The quest's beginning, fixed by the console command setstage MS02 10. Escaping the mine with Madanach, fixed by the console command setstage MS02 100, using the console command kill 000198e6 (Thonar), or by casting a Fury spell on Thonar. When your items are returned, if you have the quest Alduin's Bane active, you may not get the Elder Scroll back, thus breaking the main quest. Loading a previous save can fix this. Likewise, a quest amulet or weapon that is hotkeyed (as described in the notes above) may not be returned, thus breaking the quest. ? Only loading a save prior to capture will fix this. Carefully unfavorite any quest items before capture. Gold might not be returned. On PSVR only, the summer 2018 patch (1.4.40.0.8) broke this quest; after submitting to the guards and agreeing to go to jail, you will end up with a black screen almost immediately. You will still hear some audio for a short time, but very quickly you will be unable to see the menu, click any buttons or choose any actions, or hear any sounds. Your only option will be to close the application. ? The bug occurs while Urzoga gra-Shugurz is speaking to you. If you load an old save and kill her before starting the quest, the bug should not be triggered, although due to another bug, killing her might lead to you not being able to escape the prison. If you own the game on disk, delete your installation, then re-install the game, but don't apply any patches. Play the game; after you've exited the cell, it should work to save the game, apply all patches, then continue playing. If you side with Madanach, when your items are returned by Kaie, ALL your quest items may be missing. Exiting the Markarth ruins to Markarth proper (through the door that's right in front of you at this point) should return your missing quest items. If you decide to kill Madanach and proceed to exit Cidhna Mine, sometimes the quest will not continue and Thonar Silver-Blood is nowhere to be found. This is fixed by entering the console command prid 198E6 to select Thonar, and then moveto player. This will teleport Thonar Silver-Blood to you. Simply talk to him and retrieve your pardon to finish the quest. If you pickpocket the note from Madanach, then later kill him, the quest will update to 'Search Madanach's body' (stage 200), but even when you loot all items, it will not progress to the next stage, 'Read Madanach's note'. To fix, place Madanach's note back on his body, and pick it up again. If you have read Madanach's note at any stage before looting it as part of the quest, the quest will not update further. Fixed by the console command SetObjectiveCompleted MS02 210 1. When outside you may need to manually finish the objective "Escape from Cidhna Mine" by the console command SetObjectiveCompleted MS02 220 1. There is a dead body in the water in Markarth. A Forsworn may raise him during the battle in the city, and the resultant ash pile of him may never be cleared. The same thing may happen to Thonar's body. ? Entering and exiting the ruins right behind you while Madanach and Thonar are talking will cause Madanach and the Forsworn to disappear and no one will have died. You may not be pardoned when the quest ends, leading to very confused guards who don't have a jail to put you in. If the quest Rebel's Cairn is active, then during the jail term, Red Eagle's Fury will be equipped; it is not shown in your inventory but can be used. ? Killing everyone in the mine prior to this quest will cause the quest to be uncompletable, as the mine does not respawn. There seems to be no way to intimidate Borkul. The Brawl option will always display, even though it should only show up if your Intimidate check fails. Even though the guards say you are going to Cidhna Mine forever, mining ore may still get you out normally, as if you had served your time. ? If you kill Madanach and escape by yourself, Thonar may attack you on sight but you won't be able to kill him. To fix this, cast a Calm spell on him. Another way to fix this is to run away until you are able to fast travel. Wait 24 hours and then return to escape exit point, Thonar should be calm and complete the quest. 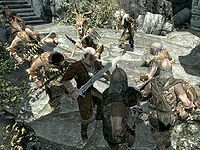 The non-hostile Forsworn throughout the Reach resulting from siding with Madanach may persist across different save games and characters where you have not sided with Madanach. ? If you remove, sell, dismantle, etc. parts of Armor of the Old Gods set, it might appear back in your inventory/partners inventory (if put in it). ? 5 I'm imprisoned inside Cidhna Mine, framed for Eltrys' murder. I have to find Madanach, the King in Rags, and clear my name. 100 Finishes quest I have helped Madanach escape Cidhna Mine, and he and his Forsworn have taken credit for all my past crime, clearing my name in the Reach. 250 Finishes quest Thonar Silver-Blood has granted me a pardon for killing Madanach. My name has now been cleared in the Reach. The following empty quest stages were omitted from the table: 0, 20, 55, 75, 77, 80. On the PC, it is possible to use the console to advance through the quest by entering setstage MS02 stage, where stage is the number of the stage you wish to complete. It is not possible to un-complete (i.e. go back) quest stages, but it is possible to clear all stages of the quest using resetquest MS02. This page was last modified on 2 February 2019, at 03:38.